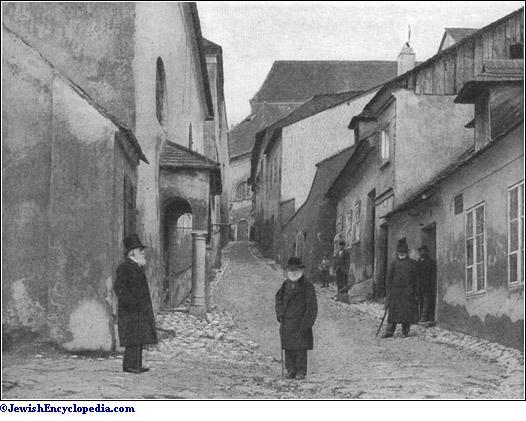 A Street in the Nikolsburg Ghetto. Town in southern Moravia. The settlement of the Jews in Nikolsburg dates probably from 1420, when, after the expulsion from the neighboring province of Lower Austria, fugitives settled in the town under the protection of the princes of Lichtenstein. The expulsions of the Jews from the cities of Brünn and Znaim (1454) may have brought additional settlers. The community first became important in 1575, when the emperor gave Nikolsburg to Adam von Dietrichstein, whose son, Cardinal Franz von Dietrichstein, was a special protector of the Jews, their taxes being necessary to the prosecution of the Thirty Years' war. The expulsion of the Jews from Vienna in 1670 brought another large group of new settlers to Nikolsburg, which is about 50 miles distant from the capital, and at the census taken under Maria Theresa 620 families were found established there, making the Jewish population of the town about 3,000, or one-half of the total population. Naturally, only a few of them could win a living in the town; most of them peddled, or frequented the fairs in Lower Austria, from which the inhabitants of the various fair towns endeavored to exclude them as late as 1794. The congregation suffered severely in the Silesian war, when the Prussians levied a contribution of 9,000 florins, and took all horses owned by Jews (1744). The Jews of Nikolsburg had further tofurnish their share in the contribution of 50,000 gulden exacted by the government of Maria Theresa from the Jews of Moravia. In 1778, during the preparations for the war with Prussia, the Neu-Schul was used as a military storehouse, although the congregation offered other places. 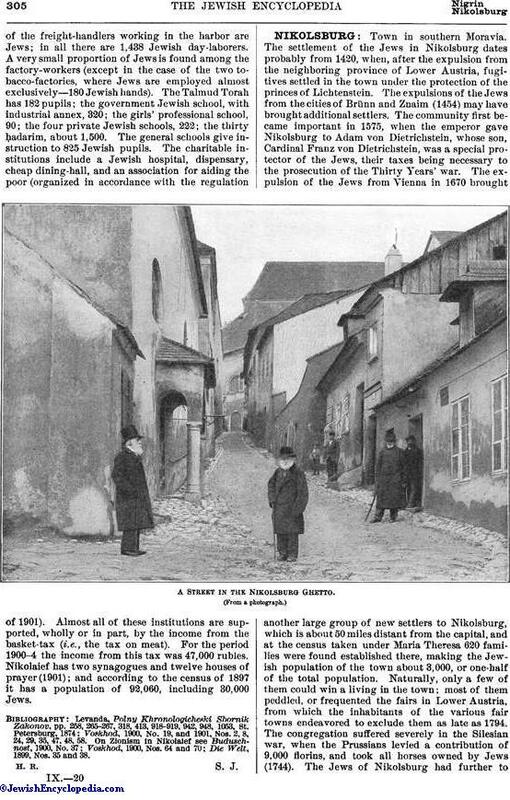 Quite a number of Nikolsburg Jews continued to earn their livelihood in Vienna, where they were permitted to stay for some time on special passports. 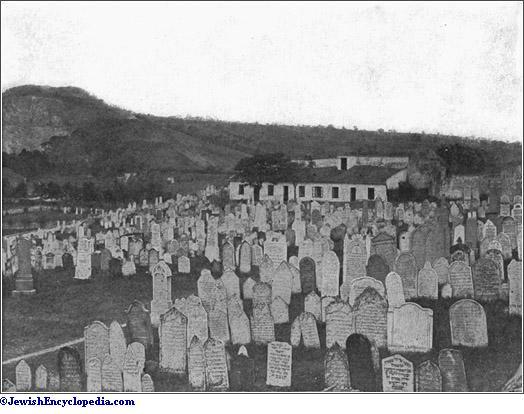 The freedom of residence which was conceded to the Jews there in 1848 and 1860 reduced the number of resident Jews in Nikolsburg to less than one-third of the population which it contained at the time of its highest development. At the present time (1904) there are 749 Jewish residents in the city in a total population of 8,192. Up to 1868 the community had about a dozen synagogues, some named after their founders—as the Wiener Schul, founded by the Vienna exiles—and some serving as centers for the gilds (of which the community had quite a number)—as the Kazowim-Schul and Schuster Schul. Another synagogue, founded by Schmelke Horowitz, was consecrated to the propagation of the Ḥasidic doctrine and was called "Chasidim-Schul." In 1868 the synagogues were reduced to five, and at present there are only two—the Alt-Schul, the cathedral synagogue of the "Landesrabbiner" of Moravia, and the Neu-Schul. 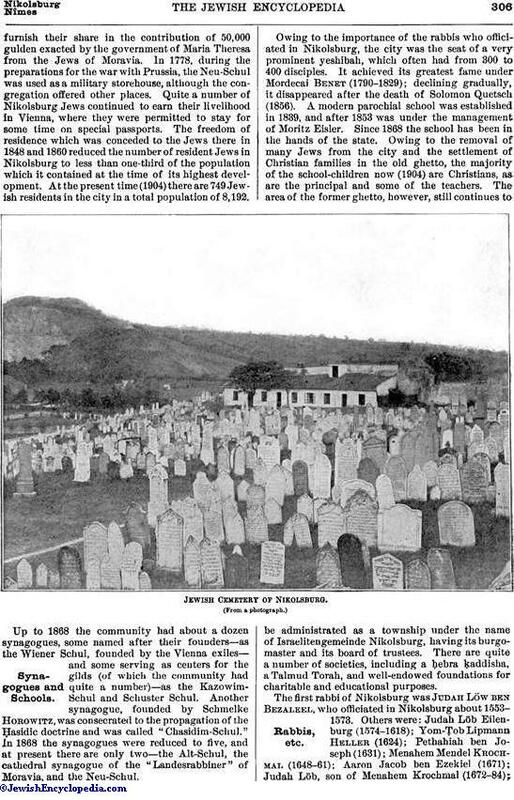 Owing to the importance of the rabbis who officiated in Nikolsburg, the city was the seat of a very prominent yeshibah, which often had from 300 to 400 disciples. It achieved its greatest fame under Mordecai Benet (1790-1829); declining gradually, it disappeared after the death of Solomon Quetsch (1856). A modern parochial school was established in 1839, and after 1853 was under the management of Moritz Eisler. Since 1868 the school has been in the hands of the state. Owing to the removal of many Jews from the city and the settlement of Christian families in the old ghetto, the majority of the school-children now (1904) are Christians, as are the principal and some of the teachers. The area of the former ghetto, however, still continues to be administrated as a township under the name of Israelitengemeinde Nikolsburg, having its burgo-master and its board of trustees. There are quite a number of societies, including a ḥebra ḳaddisha, a Talmud Torah, and well-endowed foundations for charitable and educational purposes. The first rabbi of Nikolsburg was Judah Löw ben Bezaleel, who officiated in Nikolsburg about 1553-1573. Others were: Judah Löb Eilenburg (1574-1618); Yom-Ṭob Lipmann Heller (1624); Pethahiah ben Joseph (1631); Menahem Mendel Krochmal (1648-61); Aaron Jacob ben Ezekiel (1671); Judah Löb, son of Menahem Krochmal (1672-84);Eliezer Mendel Fanta (1690); David Oppenheim (1690-1705); Gabriel Eskeles (1718); Gershon Politz (1753-72); Schmelke Horowitz (1773-78); Gershon Chajes (1780-89); Mordecai Benet (1789-1829); Nehemias Trebitsch (1831-42); Samson Raphael Hirsch (1846-51); Solomon Quetsch (1855-56); Mayer Feuchtwang (1861-88), and his son David Feuchtwang (1892-1903); and Moritz Levin (since 1904). 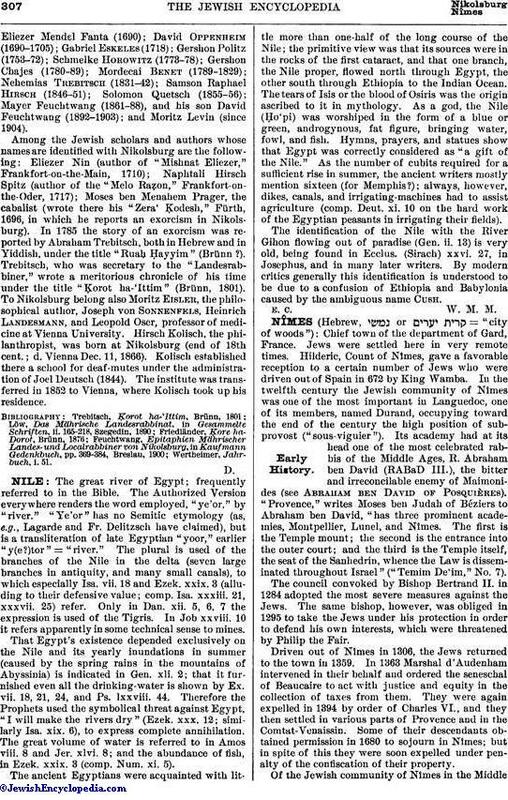 Among the Jewish scholars and authors whose names are identified with Nikolsburg are the following: Eliezer Nin (author of "Mishnat Eliezer," Frankfort-on-the-Main, 1710); Naphtali Hirsch Spitz (author of the "Melo Raẓon," Frankfort-on-the-Oder, 1717); Moses ben Menahem Prager, the cabalist (wrote there his "Zera' Ḳodesh," Fürth, 1696, in which he reports an exorcism in Nikolsburg). In 1785 the story of an exorcism was reported by Abraham Trebitsch, both in Hebrew and in Yiddish, under the title "Ruaḥ Ḥayyim" (Brünn ?). Trebitsch, who was secretary to the "Landesrabbiner," wrote a meritorious chronicle of his time under the title "Ḳorot ha-'Ittim" (Brünn, 1801). To Nikolsburg belong also Moritz Eisler, the philosophical author, Joseph von Sonnenfels, Heinrich Landesmann, and Leopold Oser, professor of medicine at Vienna University. Hirsch Kolisch, the philanthropist, was born at Nikolsburg (end of 18th cent. ; d. Vienna Dec. 11, 1866). Kolisch established there a school for deaf-mutes under the administration of Joel Deutsch (1844). The institute was transferred in 1852 to Vienna, where Kolisch took up his residence.